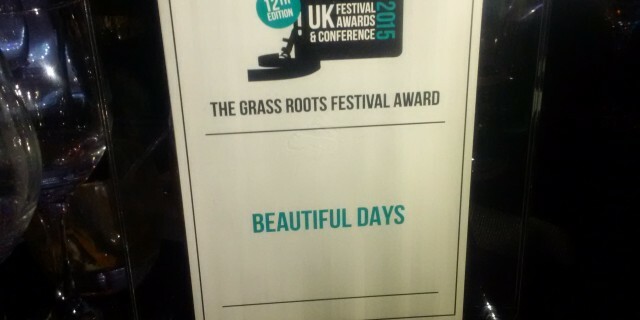 Beautiful Days won ‘The Grass Roots Festival Award’ last night at the 2015 UK Festival Awards. Huey Morgan from BBC 6 Music / Fun Lovin’ Criminals presented the Awards to a packed audience of nominees and festival industry guests at London’s Roundhouse. Beautiful Days had also been shortlisted for Best Family Festival and Best Medium Festival. The UK Festival Awards has been celebrating the efforts of the nation’s festival industry since 2004 and Beautiful Days has been shortlisted every year for a number of awards and has previously won the Best Family Festival Award in 2011 and the Grass Roots Festival Award in 2006. The Award winners are decided through a combination of online fan votes and music industry experts. Other winners on the night included Isle of Wight Festival, Bestival and Kendal Calling. Peter Gabriel was presented with the ‘Outstanding Contribution to Festivals Award’ by special guest Eddie Izzard.